1922 saw the British Empire at its absolute height covering about a quarter of the world and ruling over a quarter of the world’s population. It grew no further. And it was a country undergoing changes. 70,000 new cars a year were being produced and the number was increasing dramatically as the country continued to recover from the war. Meanwhile the trade unions were gaining in power, not least through the formation on 1 January of the Transport and General Workers Union, amalgamating 14 separate unions into one body. In more parochial matters, the Fulham Conservative Party was still unsure what would happen at the next election and whether Sir Henry Norris really would stand against them. And amidst such uncertainty the one of the leading lights of the party for many years, George Adams, passed away on 4 January. As for Sir Henry himself I am not sure when he returned from Italy, and I originally wrote here that it might have been towards the end of this month. But we find Sir Henry abroad again in February. Either he returned for a short while and then left, or he was on a very extended break. Sally Norris, my usual source on this sort of information also reports herself baffled. On 7 January, the Anglo-Irish Treaty was ratified by the Irish Parliament while football started another year with the 1st round of the FA Cup (the equivalent of the 3rd round today). Arsenal were drawn at home to Queens Park Rangers of 3rd Division (South). Having come third in the league last season QPR were again challenging for one of the top spots, but were some distance behind the two top teams, Southampton and Plymouth. This was the second year running Arsenal had been drawn against QPR at this stage – last year they had lost away 0-2, and this year wanted revenge. There was of course no thought at this time of putting out a weakened side, but still, victory would not come and Arsenal were forced into another match at Loftus Road after a goalless draw. A very pleasing 31,000 turned up for the match at Highbury, but for once there is a disagreement as to how many were at the return match. 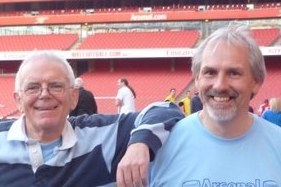 Ollier quotes 15,000 while the ArsenalHistory site quotes a very precise 21,411. Arsenal made two changes with Graham coming back in at centre half and Creegan returning at outside right – and it was the defenders Graham and Milne (the latter playing at right half) who got the goals in a 2-1 win. The following day, 12 January, all Irish prisoners taken during the War of Independence were released as the final arrangements ending the conflict were put into place. Meanwhile the flu epidemic had spread further out of London and it was subsequently announced by 13 January over 800 had died from this outbreak, and there were reports of more and more people becoming too ill to work. The following Saturday, 14 January, Arsenal played the return game with Chelsea (whom they had beaten 2-0 at Stamford Bridge on New Year’s Eve). This time they won 1-0 in front of 40,000. The inside left, Reg Boreham scored his fourth goal in consecutive league games to give Arsenal a 1-0 victory. Interestingly Reg Boreham didn’t appear in any of the FA Cup matches this season (of which there were six) suggesting that he came from a team that had already played in the FA Cup – meaning probably a Southern League team, but no one seems to know – as noted before he doesn’t appear in any of the regular reference works, suggesting further that he was an amateur. This single goal and this result finally gave Arsenal the lift it was looking for – the club was out of the relegation zone. Better still, Arsenal had the best goal average of any club in the bottom five, meaning that if points were equal it would be Arsenal who would be given the higher position. The second league game of the month was on 21 January 1922 and saw the Highbury pitch once more being described as a “quagmire” with Arsenal playing last season’s champions (and currently second in the table) Burnley. The result was a goalless draw. And perhaps part of the success of this top v bottom type of match was the fact that despite the fact that the flu epidemic was still in full flow there were only two changes to the team, suggesting again that perhaps the epidemic had already hit the Arsenal camp, and there were few new victims left for the virus to claim. Back with politics, the following Friday word emerged that the Fulham Conservative Party had finally found a man to replace Sir Henry Norris as their candidate (or so they thought at the time! ): Percy Gates. And it is perhaps just spending a paragraph or two considering what had happened to sour the relationship between Fulham Conversatives, and its most famous mayor, councillor and MP. All regional political parties suffered upheaval as a result of the first world war. There were no elections, senior members simply continued in post and for very obvious reasons, no new young members came through. After the war however ambitious politicians now felt it was their time – for if they didn’t move quickly (having lost five years of political activity through the war) they would probably feel their time had come – and gone. Indeed what seems to have happened is that in many constituencies specific groups simply came in with multiple members and took over an existing party, finding the old established members too used to plain sailing, and perhaps too old, to put up a fight. In Fulham the new upstarts were members of the local tradesmen’s associations – so not in any way associated with the traditional image of landed gentry conservatives, but men who had built up their own businesses and now wanted representation to look after their interests. These people, as with so many local party takeovers of the past 100 years were highly organised in a way that the local party, dependent on long serving and thus elderly volunteers operating in a network of friendship, were not. They took the constitution of the party, and used it to their ends against a group for whom party meetings were as much social events as political forums. In Fulham, as long serving, hard working and dedicated men like George Adams and James William Webb passed on, they move in, and had no reverence for Sir Henry, and his position of eminence achieved in the war years. And it was not only Sir Henry they were willing to take on. Percy Gates, the first man put up to replace Sir Henry was quickly moved on. Then Harry Greer, a northern MP who wanted to move south, came in, but again was pushed aside quickly. It was when the party invited Sir Henry to support their third selected candidate Kenyon Vaughan Morgan, that Sir Henry spoke to the Fulham Chronicle reporters, to say that no he would not be supporting the new man, and he would not be involved in Fulham politics any more. Having become the representative for Sands End on the local council in 1906, after 16 years he had had enough. He was ill, and increasingly it seems as if he had had enough fighting. I am not sure when Sir Henry and his family arrived back from Italy or when exactly he made his situation clear to his local party, but whenever it was he could only have been pleased with what he found at Arsenal, especially when added to the good results noted already Arsenal won 3-2 away at Bradford (ie Bradford PA) in the second round of the cup. White who had served the club so well as its leading (and generally only) scorer in the opening months of the campaign got two goals and Blyth the other. Arsenal had games in hand not least because of the habit of the time of the League scheduling a complete set of fixtures from the date of the 2nd round of the Cup onwards. Arsenal still being in the Cup obviously were not able to play these games, while some others could. Manchester United’s situation looked particularly dire and Arsenal could console themselves again with their much better goal average than Bradford City. What’s more with Arsenal’s current form Blackburn Rovers looked like a club that could be overtaken.